Staff Centre Group of Companies always bring new knowledge and modern shipping business processes into it's management system to improve quality and level of all compnany's activities. 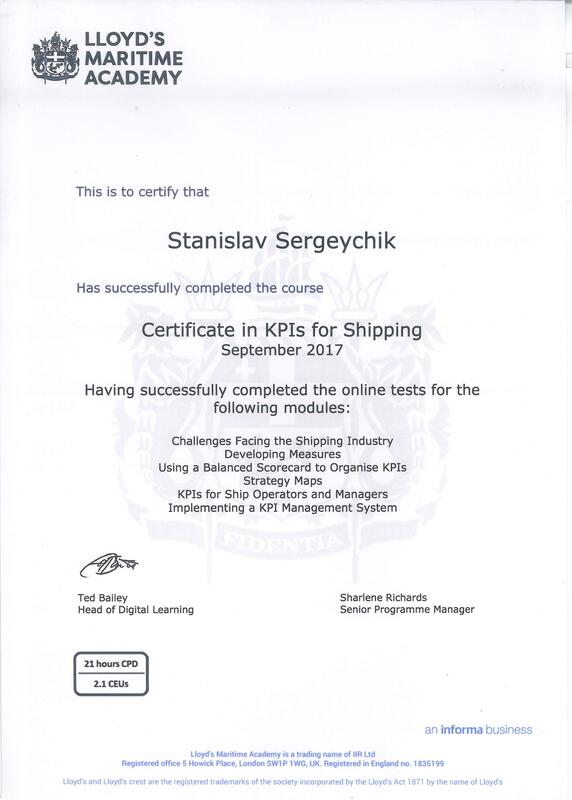 This time Commercial Manager Stanislav Sergeychik succsesfuly passed KPIs courses of Lloyd's Maritime Academy and achieved Certificate in KPIs for Shipping. In order for a company to plan for the future, management must first have a vision as to where it wants the organization to be at some point in the future; it must have a strategy to achieve that vision; it must define the strategic objectives along the way; the key processes that will be central to achieving these objectives; and the measures which it will use to record outcomes. Finally, it must set targets to which it can compare actual performance and so monitor progress towards those objectives. How this new knowledge will effect company? We will improve business analysis, identifying those key processes that are critical to a company's performance. Using KPIs will drive performance improvements.